Extra light olive oil and sunflower oil are great options to use when you deep-fry foods. They have a high smoke point and heart-healthy unsaturated fats. Other good options include canola, safflower and peanut oils. The smoke point is the temperature at which an oil starts to break down and produce harmful compounds, which you want to avoid. Choosing an oil with a high smoke point lets you cook at a higher temperature safely, so the food can cook more quickly and absorb less oil. This is better for your health and your waistline. Sunflower oil and extra light olive oil have the highest smoke point, followed by peanut oil, canola and safflower oil. Eating saturated fats and trans fats can raise your cholesterol, so the American Heart Association recommends reducing saturated fats to less than 7 percent of your calories, eliminating trans fats as much as possible. Polyunsaturated and monounsaturated fats may help improve blood cholesterol levels when you replace the unhealthy fats in your diet for unsaturated varieties. Liquid frying oils such as peanut, canola, sunflower, safflower, sunflower and olive oil are good sources of unsaturated fats. Olive oil, sunflower oil, canola oil and high oleic varieties of safflower oil are excellent sources of monounsaturated fatty acids. Olive oil can lend a Mediterranean flavor to cooking, whereas the three former oils have a very light flavor. However, the typical extra virgin olive oil has a much lower smoke point than other oils. When you deep-fry with olive oil, choose extra light, the most refined olive oil, which has the highest smoke point. Additionally, high oleic sunflower oil is a good choice for deep frying due to its high smoke point and high levels of heart-healthy fats. Don't reuse frying oil or keep it at high temperatures for prolonged periods -- it will form unhealthy free radicals and trans fats. For this reason, the American Heart Association recommends that you avoid commercially fried foods due to the likelihood of a higher trans fat content, since the oil is reused many times. 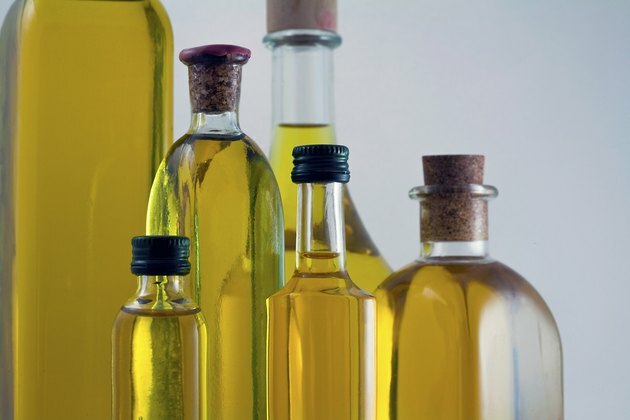 Does Overheating Olive Oil Turn it to Trans Fat?